Until January last year, I was using Benefit's Dear John moisturiser. I mainly bought this because it said there was marshmallow extract in there and I'm a sucker for sales pitches. (Marshmallows in a moisturiser? Are you insane! That's the cutest thing ever. I must have marshmallows on my face!). When it ran out I just bought a cheap moisturiser from Superdrug and never got around to getting a replacement. Then I discovered it had been discontinued, along with my favourite ever blusher which I am stocking up on for the years to come. 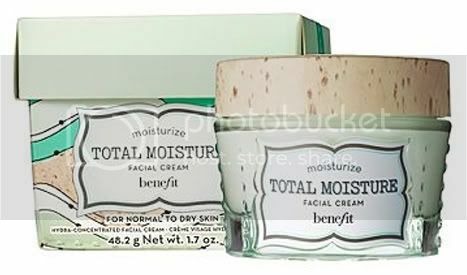 However, Benefit had released a new moisturiser as part of their newly launched B.right range: Total Moisture Facial Cream. I did what every girl worth her bath salt does and Googled it first. Uh-oh. The reviews were not good. "So thick and oily". "This made me break out like I never have before". "The smell is overwhelming". Hmmm... It was not looking good. Nevertheless, I headed over to Debenhams and dived into the tester pot. I'm very glad I did because I found this to be amazing! It is thick, yes. It's quite difficult to apply because of this consistency but the upside of this is that you only need a tiny, tiny amount. The smell is floral and it is pretty strong, admittedly. I think it smells lovely though. It's such a summery smell. It makes me happy! Then there is the moisturising level. It's perfect! It sinks in well and it doesn't make my skin oily or greasy at all. As of yet, my skin has not reacted badly to it. It just makes my face feel soft and smooth for hours. Ooh and you want to know the best bit? The glass pot (yeah, very heavy. Buy a little plastic pot to decant into if you plan on travelling) is the cutest thing ever. When I finish it, I plan on rinsing it out and using it to store kirby grips and the like. It will look adorable sat on my dressing table. Yep, I'm pretty happy with this one.